Many people may think herbal care is new but it has been around for centuries. Skin care brand Napiers is keeping tradition alive with powerful herb and plant remedies. Founded by Duncan Napier, botanist and herbalist, who became interested in herbal medicine while attempting to cure a pesky cough. Napiers began as a small herbal shop in Bistro Place and later a health food store in Edinburgh, Scotland. As the brand grew they began to produce product and soon after gained massive respect in the industry, and after over 150 years they still thrive. Their groundbreaking blends of organic ingredients offer a never-ending list of guilt-free benefits. Best British Bitters- Home remedies seem to never disappoint and Napiers seems to have one for every situation. If you have issues with digestion or want to relieve your body after a binge you may want to try this remedy. Bitters are herbs with a hint of flavor. They are often used in alcohol but can be consumed with any beverage. The Relaxing Essential Oil Blend- Formulated with a blend of rose, Ylang-Ylang, and Vetiver, this blend is known to help the body relax and refocus. 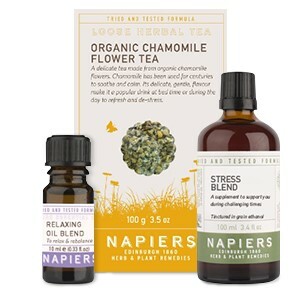 Napiers Stress Blend- A liquid supplement created to promote sleep. Made with various extracts it works best with a relaxing tea such as chamomile. Organic Chamomile Flower Tea- Have a glass of tea before bed and indulge in a good night’s sleep, it can also be used to relieve stress. Red Rice Yeast Capsules- For those who suffer from high cholesterol this herb and plant remedy may do the trick. Combined with a low-cholesterol diet, the powerful ingredient monacolin K, CoQ10 and grape seed extract these capsules help balance normal cholesterol levels. 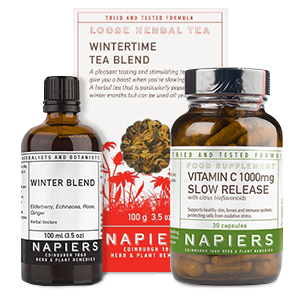 The Winter Support Package- A combination of vitamin c capsules, Winter Blend food supplement and wintertime tea to help your body get through the winter and can be purchased here. Capsicum and Ginger Warming Cream- Frequently used for massage, this cream helps relieve muscle tension and stimulate circulation. Use it to fight headaches or improve circulation in fingers and toes in the blistering cold. Organic Bugbuster Cream- If you’re lucky enough to enjoy the holidays outdoors you may need insect repellant. This product is formulated without the harsh chemicals found in normal repellant but is said to perform just as well. Men love product just as much as women and Napiers offers an insane variety. From skincare, to capsules concerning vitality and sexual health Naperis makes it easy for men to find product that are effective and formulated without harmful ingredients. Some may think children don’t need products but Napiers knows otherwise. The brand offers many products for babies including a bed time tea. If you are expecting Napiers also has products to help maintain the health of you and your child throughout pregnancy. Fight aging with botanicals, herbs, vitamins, minerals, and essential oils. 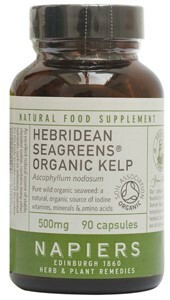 An all natural approach to aging sometimes means a limited product selection but Napiers offer several dozen.